Blackboard and its regional partner ISB, in collaboration with LAU’s IT Department, organized a daylong summit on the Beirut campus. Tim Collin, Blackboard vice president for the Europe, Middle East and Africa region, presents a lecture on the growing use of technology in education. At the Blackboard Summit, Collin drew attention to a shift in educational trends that has led to a steep increase in global competition among educational institutions. Online-education software giant Blackboard and its regional partner ISB in collaboration with LAU’s IT Department held a full-day, six-session summit at LAU Beirut on October 22 to discuss the growing need and ways to integrate technology in education. Blackboard and IT Department representatives, as well as LAU faculty members and a student, presented their visions for teaching and learning. They also talked about the globalization of education and the potential of technology to make education accessible to more people. Founded in the United States in 1997, Blackboard employs over 1,000 people and works with more than 5,000 institutions including primary schools, universities and workplaces around the world. It provides its clients with software and services, making use of the latest digital and online technologies to increase the reach and impact of education worldwide. LAU adopted e-learning technologies in 2000 when WebCT, an online course-management tool that has since merged with Blackboard, was introduced to the university. This year, 83 LAU faculty members are using Blackboard for 159 courses, up from just 26 faculty members for 56 courses three years ago, according to the IT Department. At the summit, English, finance and computer science faculty revealed creative ways of learning made possible through technology in their particular fields. Roy Majdalani, assistant vice president for IT, explains that the use of technology in learning has become a must in order to communicate properly with students who grow up in a digital age and demand that their universities keep up with the times. Nowadays, “students want to learn randomly — anywhere, anytime, at any place, and at their leisure,” says Majdalani. So old-fashioned teaching methods are no longer effective enough, he adds. The summit was the first of its kind in Lebanon. 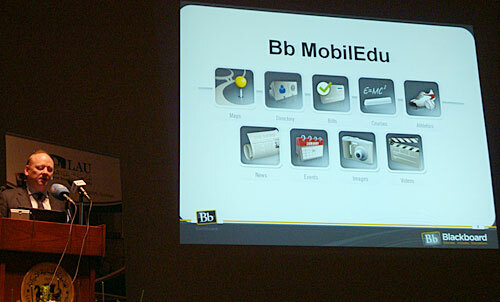 Blackboard organized a similar conference in Bahrain last year and in Dubai in 2007. The event opened with short remarks by LAU President Joseph G. Jabbra who called on the government and the higher education sector to work together “to respond to society,” by expanding educational opportunities. He added that new online services and technologies such as those offered by Blackboard provided a solution to the challenge of educating students who cannot afford to pay university tuition. “One must level with the reality of today when a lot of students … cannot afford to come to the campus. Therefore, it is not only our responsibility, but rather our obligation to take the campus to them,” Dr. Jabbra said.